The controversy surrounding the young star, Fomalhaut, has taken an intriguing turn as astronomers who have enlisted the help of the Atacama Large Millimeter/submillimeter Array (ALMA) have revealed that planets orbiting the 25 light year distant star are much smaller than once thought. The findings allow scientists to move forward in understanding the formation and evolution of nearby planetary systems. Fomalhaut, which hosts a ring of orbiting dust, has been at the centre of a debate as to whether it really hosts a planet, since infrared images from the Spitzer Space Telescope failed to rediscover a purported planet seen by the Hubble Space Telescope (see http://arxiv.org/abs/1201.4388). However, clutching high-resolution images from the Chile-based telescope, the team, led by Aaron Boley at the University of Florida, believe that they have finally put the argument to rest with a clever combination of images and computer simulations that reveal the inner and outer edges of the thin dusty disc, which swirls around the star, to have sharp edges. These edges, the team have concluded, are the mark of a pair of planets acting like shepherds to gravitationally keep the dust particles in check. Any smaller than Mars and the planets would have no effect, while any larger than a couple of time the mass of the Earth and their gravity would be enough to destroy the structure of the ring. Therefore their masses must lie somewhere in between. 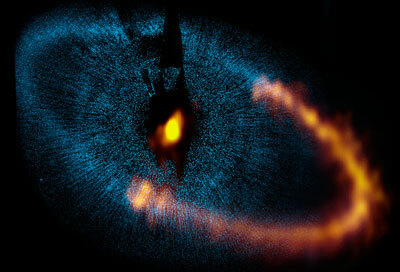 An ALMA image of the dust ring around the bright star Fomalhaut. The underlying blue picture represents an earlier image returned by the NASA/ESA Hubble Space Telescope. Note that ALMA has so far only observed a portion of the ring. Credit: ALMA (ESO/NAOJ/NRAO). Visible light image: the NASA/ESA Hubble Space Telescope. "The Spitzer null detection confirmed that the planet needs to be less than one Saturn mass," Boley tells Astronomy Now. "Our results are consistent with this interpretation and explain why the planets are difficult to detect." Hubble hadn't seen these sharp edges because it was looking at emission from tiny microscopic grains of dust, thought to be fluffy aggregates of interstellar material. At the wavelengths ALMA operates at, Boley's team saw larger dust grains 1mm in size. These are large enough not to be blown around by radiation pressure from Fomalhaut's starlight and to retain the shape of the ring, which is 16 astronomical units wide (16 times the distance between Earth and the Sun) and placed 140 astronomical units from Fomalhaut. This is three and a half times the distance from the Sun to Pluto, meaning the two planets are likely to be among the coldest yet found orbiting a normal star. The next step will be to go beyond simply inferring the planet's existence from the sharply defined dust ring, and to attempt to image the planets. This however may prove difficult with their cool temperatures and is likely to require the advent of the next generation of giant telescopes such as ESO's European Extremely Large Telescope.